Native American Transportation Issues Committee (ABE80). 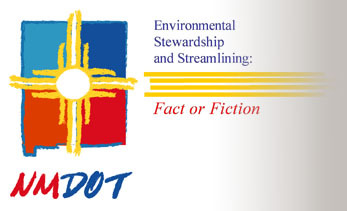 The New Mexico Department of Transportation, with the assistance of the SRI Foundation, sponsored the 2005 Transportation Research Board (TRB) summer meeting of the ADC10 Committee on Environmental Analysis in Transportation, the ADC50 Committee on Historic and Archaeological Preservation in Transportation, and the ABE80 Committee on Native American Transportation Issues. This conference brought together over 200 transportation and environmental professionals from around the country to review and critique past national efforts involving environmental streamlining and stewardship. The benefits and problems associated with these efforts were examined from the perspective of Tribes, the public, and environmental and transportation professionals. Presenters and attendees included key staff from Federal Highway Administration (FHWA) headquarters, state FWHA division offices, state Departments of Transportation (DOT) environmental and design offices, Tribes, Federal and state environmental resource agencies, non-profit environmental organizations, and private sector firms. During the conference, there were many opportunities, both structured and informal, for discussions and networking about environmental streamlining and stewardship. • Wayne Kober, Wayne W. Kober, Inc.
• William Malley, Akin, Gump, Strauss, Hauer & Feld, L.L.P. The second part of the plenary session showcased four key projects and programs from around the country that exemplify the successes and challenges of stewardship and streamlining. The plenary session was followed in the afternoon by the three committees' sessions. Question #1: In the ideal world of transportation decision making and environmental compliance, what would streamlining and stewardship look like, and what would it accomplish? Question #2: What are the gaps between the ideal of streamlining and stewardship and the current reality, and what are the impediments to achieving the ideal? Question #3: What tools and strategies can we use to help us achieve streamlining and stewardship and overcome these impediments? How can TRB help (through research or a study)? On the morning of the third and last day of the conference, all participants reconvened, and each breakout group presented a brief report on their group's discussions and recommendations. This was followed by a time for general comments and discussion from the audience. As a final wrap-up, the plenary session speakers presented their views and opinions about what they heard during the sessions and small group discussions, ending with their recommendations on where to go from here. Archaeological Preservation in Transportation Committee. Section Three consists of papers from the joint session of the three committees. The presentations are generally in PowerPoint, while some are PDF files or Microsoft Word documents. A link to a presentation is indicated by an underline. If there is no link, then the presentation did not include a written paper or PowerPoint presentation. In Section Four are the notes from the facilitated group discussions. Section Five presents the conference's Wrap-up Session. The latter includes notes from the audience discussion and the plenary speakers' recommendations on where to go from here. We wish to thank and acknowledge the following individuals who helped in organizing the 2005 Summer TRB conference. ¡Gracias a todos! Thanks for helping organize the conference sessions! CDR Associates of Boulder, Colorado developed the format for the breakout group discussions, facilitated these discussions, and also recorded and transcribed all of the notes from the group discussions and the conference wrap-up session. Á Muchisimas gracias! Plenary session speakers addressed the conference theme, presenting their responses to the following questions: What are streamlining and stewardship? Have we really streamlined projects and programs, and have we become better stewards? How do we know when we have done streamlining and stewardship? What are the practical, realistic outcomes of streamlining and stewardship? • William Malley (pdf 7.7 MB), Akin, Gump, Strauss, Hauer & Feld, L.L.P. • "Maryland ICC Project: Elements of Streamlining Success," (pdf 5.9 MB) Megan Stanley, PB Consult Inc.
• "An Environmental Streamlining Success Today and a Building Block for Tomorrow: Louisiana 1 Improvements Project," (pdf 1.3 MB) Michele Deshotels, Louisiana DOTD and Chris Gesing, Michael Baker Jr., Inc.
• "North Carolina Department of Transportation Archaeological Predictive Model: Field Verification and Implementation," Matt Wilkerson, North Carolina DOT; Scott Madry, Environmental Services, Inc.; and Benjamin Resnick, GAI Consultants, Inc.
• "Past, Project and Future: The Baltimore Transit Study's Use of GIS for Project Streamlining and Stewardship," Henry Ward, Parsons Brinkerhoff and Barbara Hsiao Silber, McCormick Taylor, Inc.
Conference participants broke out into groups to discuss the conference theme, using information, ideas, projects, etc. discussed in earlier sessions, and their own experiences. Each group worked on defining what the goals and outcomes of streamlining and stewardship should be. These goals and outcomes need to be practical, reasonably attainable, and easily understandable by all. Groups also discussed practical ways to move streamlining and stewardship toward fulfilling these goals. Click here for notes from the group discussions. Brief presentations/reports by breakout discussion groups. Plenary session speakers presented their views and opinions about what they heard during the sessions and small group discussions, ending with recommendations on where to go from here. Click here for notes from the audience discussion and the plenary speakers' recommendations.